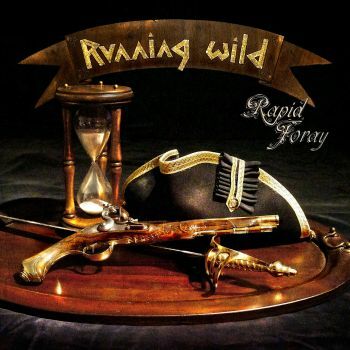 RUNNING WILD - RAPID FORAY LTD. EDIT. (DIGI+POSTER) | Online Shop | Wizard LTD. Album: "RAPID FORAY LTD. EDIT. (DIGI+POSTER)"
Running Wild are one of the greatest phenomena on the current metal scene: few German bands enjoy such an outstanding reputation and look back at such a long and exceptionally successful career. Since the release of their debut album Gates To Purgatory in autumn 1984, pirate captain Rock´n`Rolf Kasparek has unerringly steered the band past all the rocks and shallows of the volatile, occasionally difficult but always exciting metal genre. As a vocalist, guitarist and composer, Kasparek has released a whole range of undisputed cult albums with Running Wild over the past more than 30 years and wowed his fans on countless tours. Such an awe-inspiring tradition brings with it an obligation, so of course Running Wild set themselves ambitioned targets when they started working on their latest album Rapid Foray and are now ready to present one of the most diverse releases of their whole career. Rapid Foray takes up seamlessly where the group’s greatest recordings left off while sounding contemporary, vibrant and always surprising at the same time. “The eleven new tracks are more complex than those on our previous two releases,” Kasparek reveals, “which I noticed in particular when we were recording the guitars. At the same time some of the numbers remind me of Running Wild classics. I feel that we’ve come up with a very interesting and impressive mix.” Rapid Foray will be available on Steamhammer/SPV from 26 August as a boxed set, Digipak, double vinyl LP and for digital download. Rapid Foray was produced by Rolf Kasparek with Niki Nowy as sound engineer, who also mixed and mastered the material together. The cover artwork is based on a photo by Kasparek which Jens Reinhold (Virgin Steele, Freedom Call, among others) subsequently gave the look of an oil painting. Kasparek explains the apparently belligerent album title: “The pirate image is part and parcel of Running Wild, but of course it’s all tongue-in-cheek, as you can see from the sand in the hourglass on the cover, half of which has already run out.” A motif which could also be used for fan memorabilia: Running Wild have promised a special gimmick for their lavishly designed boxed set. We’ll find out soon!